Horchata is delicious in many ways! 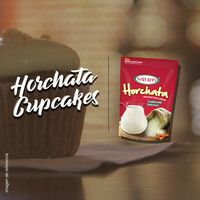 This Horchata Cupcake recipe using with our Horchata powder mix will be a success! Beat the dry cupcake mix, Horchata mix and soft butter at low speed until completely blended. Whisk eggs and milk in a different container. Bake 18-20 minutes or until a tooth pick comes out clean.